New Delhi: The Associated Chambers of Commerce and Industry of India (Assocham), in a study in February, found that nearly 56% of corporate employees sleep less than six hours a day due to high stress levels that arise out of tough targets set for them by employers. The impact of sleep deprivation, among other factors, on employee wellness—not a topic for active discussion for human resources teams until four or five years ago—has sparked a nascent but definite trend of companies integrating relaxation spaces for employees—places where they can catch a power nap or take a siesta—into office design. “This concept of having a resting space or sleeping pods (reclining chair with a cover) in the office is very start-up culture driven, a Bay Area import,” said Pallavi Shrivastava, head (sales), India, at Spacematrix, a workplace and interior design company. Among the companies which come forward to ask for such provisions are usually those that do not have strict work hours, and operate across multiple time zones. “Recharge is as important as working hard in an increasingly fluid work environment,” said Shrivastava, adding that the requests are usually leadership driven. “Our office is open round the clock. We want our employees find comfort and believe that a quick nap will refresh them and ensure better productivity,” said Anuradha Bharat, head (people operations), at Razorpay, a payment gateway start-up. The company, where the average age of employees is 26, has a four-bed nap room. According to Bharat, employees tend to take a one- or two-hour power nap at the most. Hike Messenger—one of India’s so-called unicorns (start-ups with a valuation of over $1 billion) has a nap room with four beds at each of its offices, in Delhi and Bengaluru. “Sometimes, during new launches and releases, work continues till late at night or people have to take early morning/late night flights. At that point, having a place to stretch out inside the office is an added provision,” said a Hike spokesperson. Ravi Sarangan, executive director of Edifice Consultants, an architecture and interiors firm, has a different take. He said that culturally, sleeping at office is still not accepted at Indian workplaces. “Sleeping pods are not in demand. In fact, I would say even nap rooms are not really encouraged for fear of misuse. But companies are asking for secluded breakout spaces with couches and recliners where people can take a break. This is seen in technology companies, creative spaces like advertising agencies and even companies which do research work, like in the pharma sector,” he said. Sarangan added that in his practice he has seen that this demand comes mostly from companies where the average employee age is between 20 and 30 years. 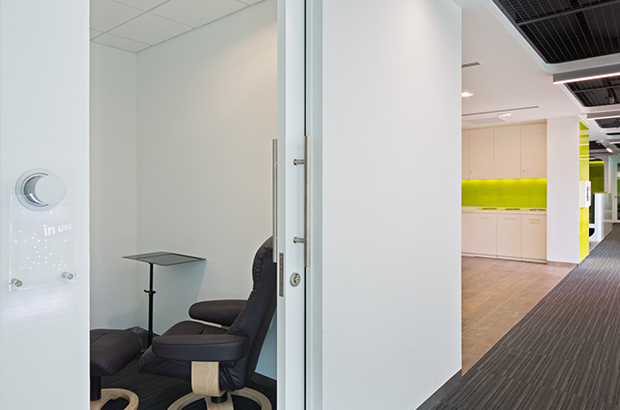 “The idea behind the entire office design was to increase work efficiency. If relaxation methods help InMobians to increase their productivity at work, then it is worth adding nap rooms or breakout zones in the office design,” said an InMobi spokesperson. The company’s office in Bengaluru has four beds, apart from beanbags, couches and egg chairs for employees to relax in, the spokesperson added. The average age of employees is between 25 and 35 years. As employee wellness becomes a key factor in human resources discourse, relaxation spaces are likely to show up more often in office design. Salman S.H. in Bengaluru contributed to this story.